All those in favour of eating brownie batter for breakfast, say “I.” All those opposed. . .
. . . please reconsider your life choices! Awwr I’m just kidding. Kind of. I don’t actually recommend eating brownies for breakfast [on a regular basis], but I do recommend eating things that are slightly (read: quite a bit) healthier and make you feel like you’re eating brownies for breakfast. Tell me you don’t want to face plant right into that. Actually, don’t — I might judge you. I know I said that I’d stop with the breakfast recipes after bombarding you with them in January, and I will… after today. I just really, really wanted to share this last one with you guys, and I figured that chocolate for breakfast was the perfect way to transition into February and set the mood for Valentine’s Day. Oh.Glory. Okay. Focus. Focusing. Breathe. To say this breakfast bowl tastes exactly like a brownie would be a lie, but it also wouldn’t be too far from the truth. Obviously we’re dealing with a different texture here since I’m pretty sure most brownies don’t come equipped with the awesome nutrition power of oats, but as far as taste goes? It’s pretty darn close. You’ve got your sweetness. Your chocolatey-ness. Your… actually, that’s pretty much it. I don’t know how to describe the taste of brownies other than “sweet and chocolatey,” and that’s basically the answer I got when I Googled it, too. Which, by the way, is a question that I wasn’t the only one asking. Apparently, “how does a brownie taste?” is something a lot of people want the answer to. But I digress. So we’ve got sweet and we’ve got chocolatey. Sound good so far? I thought so too. We’ve also got chewy, ooey, gooey, and “ohhhh my god how is this actually good for me?” That last one is a direct quote, by the way. But despite being hard to believe, this little guy really is healthy enough to enjoy for breakfast. And yes, I realize chocolate chips don’t exactly fall into the “health food” category, but I’d argue that they’re good for the soul and therefore good for overall health. You can always leave them out or replace them with some nuts if you prefer, but I’m personally not huge fan of nuts in my brownies, so I’d prefer to keep them out of my brownie batter oats. Chocolate chips aside, this breakfast bowl is packed with a good dose of fibre, healthy fat, and plant-based protein. 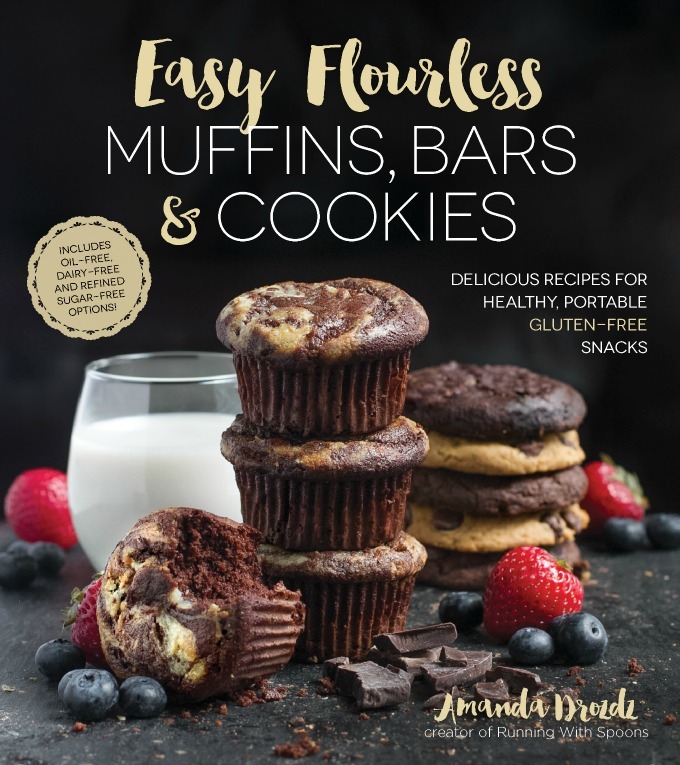 It’s vegan as long as you use dairy-free chocolate chips, and can easily be made gluten-free by using a gluten-free flour. I’ve made various breakfast bakes with all-purpose, whole wheat, spelt, rice, coconut, and almond flours before, and never really noticed a huge difference between them. It’s all up to you and your individual needs. Oh, and as an added bonus, baking this makes your house smell like brownies… which is way better than waking up to the smell of coffee. Just saying. 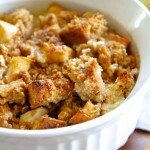 Looking for more breakfast bake recipes? Try one of these! What’s the last thing you searched in Google? Brownies with or without nuts? « . currently – february 2015 . Haha I could see myself eating this as a late night dessert! It looks absolutely amazing! I love how simple this recipe can be! Perfect for after dinner at night too. This looks amazing! I would eat this for dessert! Ok…and breakfast! My kids are looking at this with me and literally screaming that they want this tomorrow. 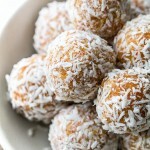 Looks delicious of course and also very healthy, maybe a weekend treat! Must keep my kids away from your site! Oh my gosh, staaaaap! This looks so good. I’m normally heavy on the protein at breakfast, but I would make an exception for this. Last thing I googled was ‘sweet potato’. I had to check my history lol. I’m also not exactly why I did that, but there it is. Also, brownies with nuts are my fav but they need to be a specific texture. If it’s chewy brownies, without nuts is definitely better. Yes, I’m a brownie snob. Yes, I am totally down for eating this for breakfast. I love how the recipes you post, I seem to already have the ingredients in my pantry. Chocolate is perfect in any meal IMO. I can’t even with how good this long – and especially that I have all of the ingredients sans coconut oil! Like someone said, I would have this dessert. And breakfast. And every meal in between. SHoot that kinda looks totally amazing!! Thanks for sharing!!! Brownies for breakfast? Yes, please!!! Can’t you post breakfast recipes at night? It’s lunch time for me over here and now you’ve got me craving brownies. 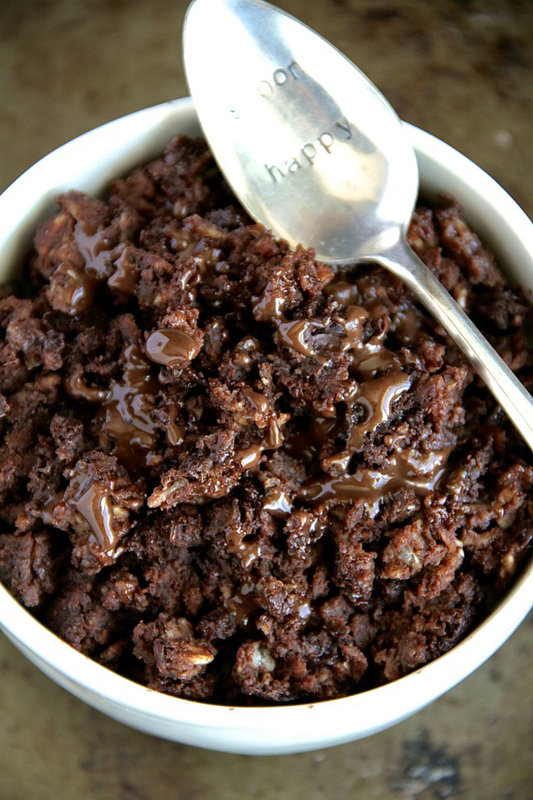 Or brownie oats. 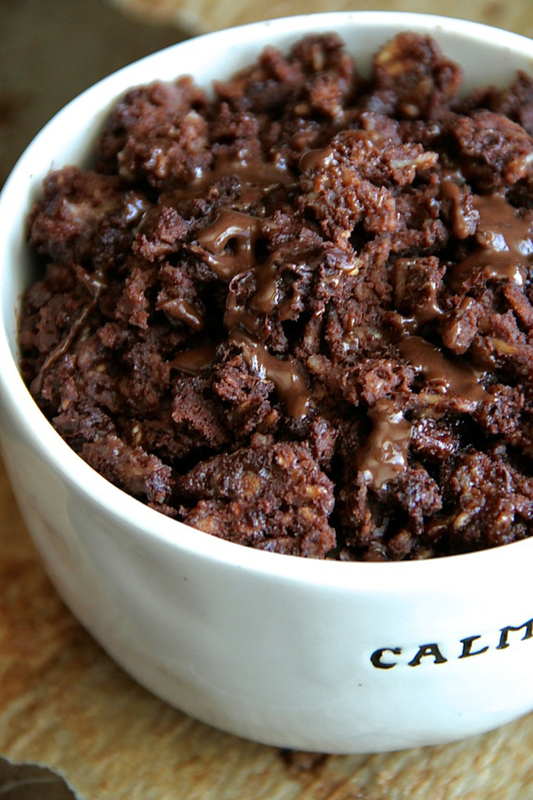 Isn’t it amazing what adding some coconut oil does to chocolatey oats? Some white almond butter and a sprinkle of sea salt on top – perfection. Also known as dinner in my world 😉 . I always wondered what heaven in a bowl looked like! Ok so if I’m being honest I would probably eat this for dessert before I’d eat it for breakfast. BUT–I’m 100% going to make this, probably even tonight. LOOKS DIVINE. This breakfast was made for me! I need it immediately and then will probably never eat another thing for breakfast again. Um WHOA! 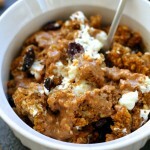 This is one of the most decadent (yet secretly healthy) breakfasts I’ve seen! While I don’t do well with sweet breakfasts, I’m so recreating this as a dessert…or a lunch…or dinner. Because, why not?! This looks incredible! I love that you made it healthy to eat brownies for breakfast (and probably several other times throughout the day 😉 ). Totally making this soon! Your pictures are always gorgeous! I am getting hungry just by staring at my screen. This recipe looks and sounds amazing. I could totally eat this for breakfast (sweet breakfast all the way for me). Thank you for sharing this! Not sure if it’s just me but I’m having a hard time commenting today! Anyways, this looks really good. Who seriously wouldn’t want cake or brownies for breakfast? They are no friend of mine LOL. Umm…YUM???? 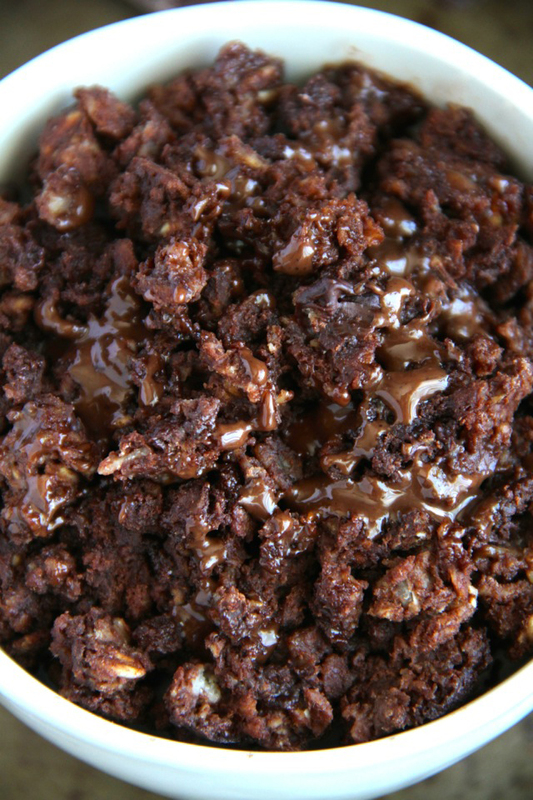 Chocolate is always a great way to start the day – and this recipe already has me drooling! THANK YOU so very much for finally posting a recipe that I can look forward to making! I wonder if my dear mother would object to me putting her dinner aside Friday night to make this?? Probably…which makes it the perfect midnight snack. 🙂 YUM. This looks sooooooooo good. Adding it to my list of things I need to try. I hate breakfast foods, so if I can find something that is super good, that’s probably all I’ll eat. Nuts totally ruin all brownies! You make brown food look good. Now that’s talent. Normal brownies don’t have oats??? Say whaaaa? 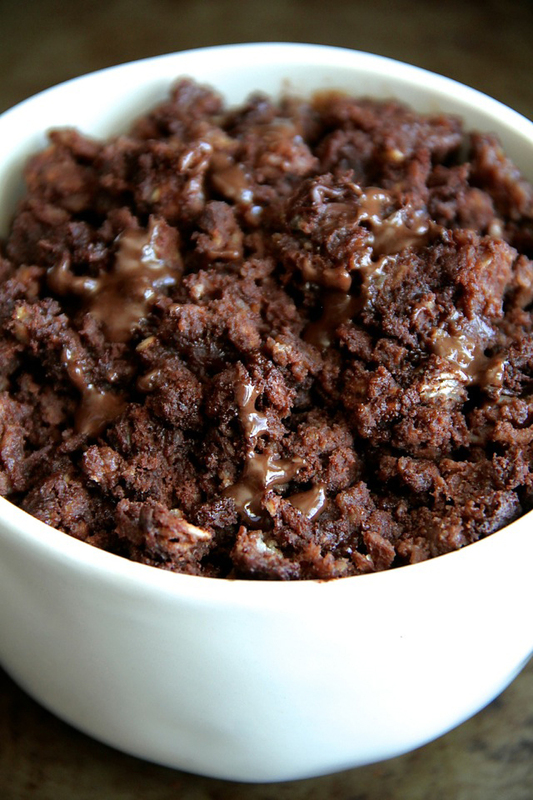 All jokes, aside this brownie batter breakfast bake looks pretty bangin’! Last Google search: “How to help dog allergies during Apoquel shortage”. Ugh, my poor dog and his allergies. It’s so severe his skin starts peeling and he’s out of his allergy pills in TWO DAYS. TWO DAYS!!! And there’s a shortage until April. Ooof. I am not looking forward to this at all. Poor guy. And brownies without nuts, but with candy/crushed truffles/toffee bits are always welcome. haha! Poor Elmo 🙁 I actually had no idea that dogs could get allergies that bad. What’s he allergic to?! “Oh.Glory. Okay. Focus. Focusing. Breathe.” …YAAS! I can breathe in ALL that chocolatey goodness!!! Yes, yes YAAS for brownies for breakfast – specially when they are disguisedas a gluten free, healthy, ooey gooey bowl of decadence! Um, this looks more like dessert to me. Holy yum! You can bombard us all you want when breakfast looks like this. And yes, chocolate chips are definitely good for the soul. Don’t hate me but I really like nuts in my brownies. Walnuts, specifically. Brandon doesn’t like them though so I usually make half with and half without and then he has the audacity to eat the half with the nuts. Sigh..he drives me crazy! So gonna make this for tomorrow’s breakfast!! 🙂 I’ll tag you on instagram! I just stalked your IG feed I’m glad you liked it, Ann! if the house smells like brownies, i’m there! save me a bowl or two! This is for one, right? Because I won’t be willing to share! I just gave it a shot- totally works. I did 45 seconds, but that was a bit raw, and after another 30 it’s a bit overdone. So I’d suggest 1min in the microwave. 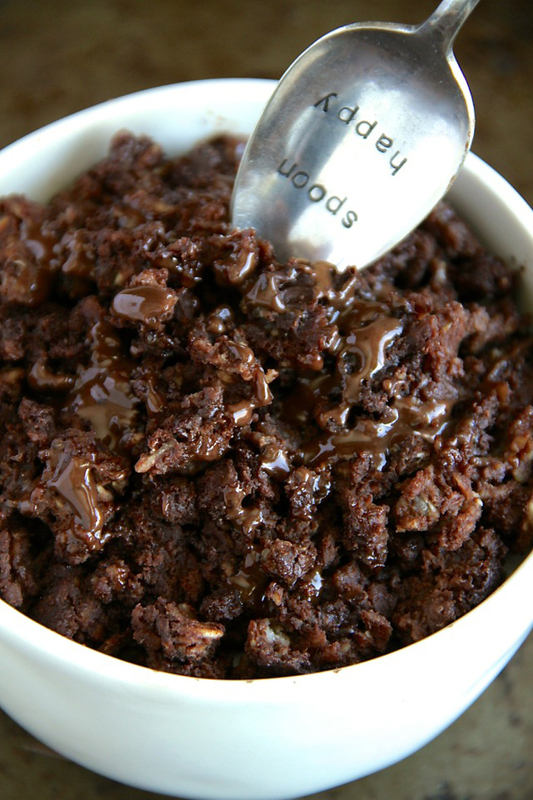 So I’ll probably make this….and eat it with my hands….ahem…..
No time to grab a spoon/fork/shovel. Plus it just looks so fun to dig my hands into. Last thing I googled was actually something I probably shouldn’t share. S’a little embarrassing and inappropriate and will just ruin the raging appetite of everyone who is salivating over this brownie bake. And NO NUTS in brownies. No. I’m gagging. I LOVE nuts, put them in baked goods, oatmeal, salads, rice pilafs, but DO NOT put them in brownies. Omg dying! This looks insanely good! Do you think this could work as an overnight oats too? Instead of baking it that is. It might, but you would probably have to add more liquid and the texture would be completely different. I love that you said “good for the soul.” I’m totally in the camp of calling some foods good for the body and some good for the soul. So important! I think it should be considered cyber or mobile bullying to be sent sneak peeks. Oh my gosh that looks amazing! I might have to make that for a late night snack. I don’t know if I can wait until breakfast. Ha! There might be! But I completely fail at cooking in the microwave so I’m not entirely sure how long you’d have to nuke it for or if you’d need more/less liquid. Er my gosh Amanda – that is abso-freakin-lutely ridiculous! Brownie batter for breakfast?? I’m raising both hands high! I think the last thing I googled was Japan Golden Week for a creative brief I was working on at work… I felt really weird when my boss came over and I had a photo of Emperor Hishito or whatever on my computer haha. Brownie batter for breakfast? You, my friend, are my hero- this looks dreamy! Don’t laugh but the last thing I googled was the difference between a ‘burrito’, ‘taco’, & ‘fajita’. Before I post a recipe next week, I just want to make sure that I am using the right terminology haha! I’m not usually the biggest chocolate fan (please don’t hate me) but this is making me want to reconsider!! It looks amazing! Oh.glory is right..whew! No surprise [or shame] in confessing that I had to go and grab something chocolaty and fudgily chewy after the first two photos 😀 . Oh breakfast foods; how I love thee. So you’re saying the exact measurement of coconut flour would work out ok? I’d probably add a splash of extra liquid with coconut flour since it tends to be much more absorbent. Maybe 2-3 Tbsp. worth? I had this for breakfast. Ohmygosh, pinning! 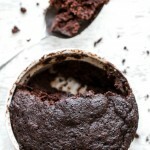 A HEALTHY brownie batter bake – for breakfast?! 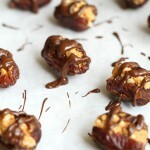 My favorite dessert + my favorite meal of the day + healthiness = EPIC! This is just too good to miss. You always have the most jaw-dropping healthy treats, Amanda! I love your site! Wow! This looks soo yummy! I can’t wait to try it! Holy jeezus, this recipe looks amazing! This looks to good to be that healthy. I’m excited to give it a try! Looks amazing!! I can’t wait to try this. This looks amazing. I am making this tomorrow. Can this be considered healthy? Nothing looks too shabby on it. I was just wondering. This looks totally amazing but can I ask why this is healthy? I’m wondering if my toddlers can also have this…. Hi Liat! 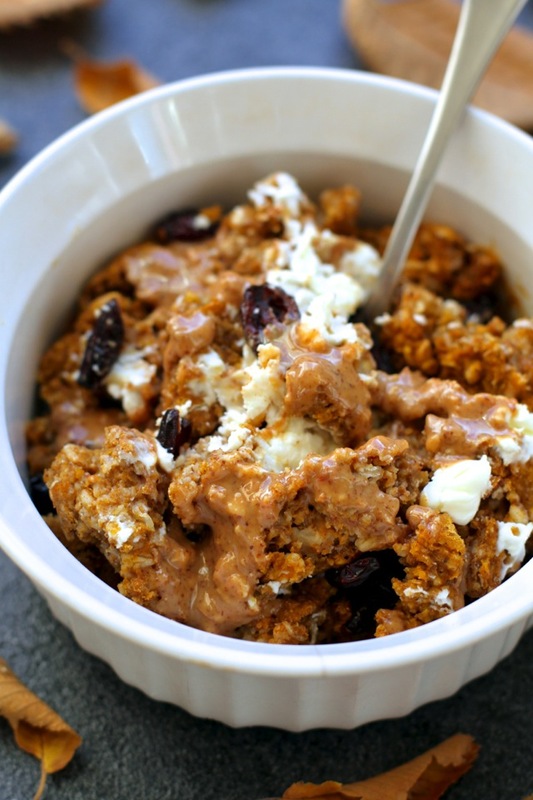 This breakfast bake is full of fibre, healthy fats, and plant based protein. It’s sweetened naturally with the maple syrup, and if you decide to leave out the chocolate chips then it’s also free of refined sugar. 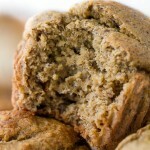 If you’re concerned about the flour, then you can simply use ground oat flour. I wouldn’t consider any of these ingredients unhealthy, and I think it would be fine to give to your toddlers. Just had this for Sunday morning breakfast… Absolutely shocked at how much it really does taste like an under-baked brownie!! Wonderful healthy treat!!! Will definitely add this to my regular recipes! Thanks for sharing! Yum! I just made a double batch following your recipe exactly. So good! My husband loved it too. Thanks for sharing! Oh my gosh, sensory overload with all the photos! Course if I got that chocolate-y smell going in our house first thing in the morning I’d have to make several of these or there would be some grumpy campers around here. Guess that could be done…. This was delicious and easy!! Yum! This was absolutely good! 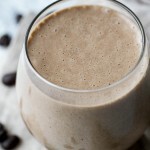 I added some chocolate protein powder to get some added benefits and I wasn’t disappointed! Ok so I pinned this a long time ago with every intention of making it, I swear! On Sunday when I went grocery shopping I said that this was the week! And, I’m so glad I did! This has got to be one of the most amazing breakfasts I’ve ever had!! It’s quick and easy. And, I’ve been putting a dollop of peanut butter in the middle for a little more protein. Thank you so much for thinking this up! This was absolutely amazing! I’ve been craving chocolate since I went vegan and this was the perfect fix! Just did it and it was so good! I added some stevia, because I like it very sweet. I will definitely do it again. Could I make a tray of this for my whole family? Just wondering how long to cook it for if I put it in an 8×8 or 9×13 pan. I’d want to make it for 8 servings. You might be my new best friend. I just had to give up dairy because my infant is allergic, and I’ve been miserable about breakfast… But today I had an oatmeal brownies for breakfast, and it was so good!! Thanks for posting this recipe! Hi! 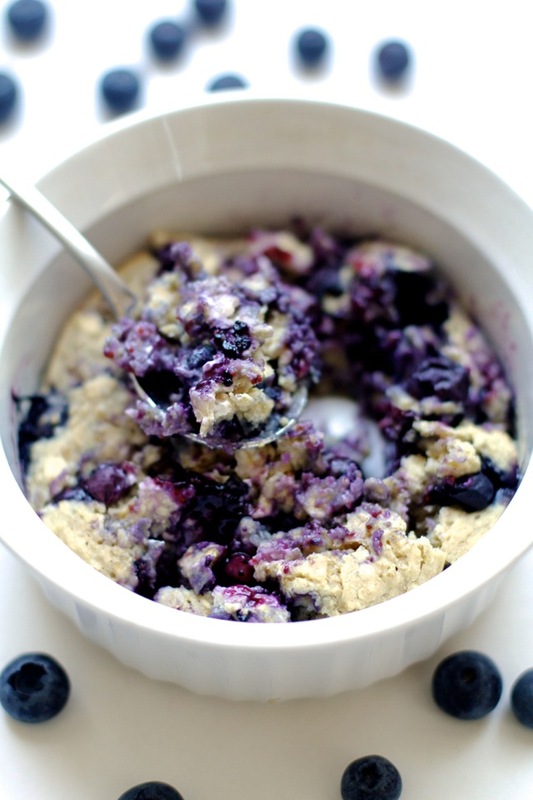 Instead of an individual serving, I’d like to make this in an 8×8 pan so I have breakfast for the week. How would you recommend increasing the ingredients needed to make that happen? Thanks! I would probably multiply the ingredients by 4, but I’ve never made it in a larger pan so I can’t vouch that the texture will come out the same. Oh Amanda, because of this recipe, you have become my favorite person in the world. I have a sweet little 5 year old boy that is allergic to wheat, soy, eggs, milk, peanuts, tree nuts (and several other things) so for him to have “treats”, I have to make them. This is by far one of his favorite recipes and mine too! It is delicious, and I wish there were a better word than that that I could use to describe it! I even made a cinnamon roll version for us recently and it was also great. I’ve made this recipe twice now and have it enjoyed it both times. So glad to have found something fun for my weekend breakfasts. If you’re interested, I posted a review on my blog, http://adlinsadventures.blogspot.com/2016/02/recipe-review-breakfast-bowls.html. I made this today. Not a fan. It was ok but not sweet enough in my opinion. After sharing this on social media, I had to try it! I’m all about some chocolate for breakfast, and this totally hit the spot for a Sunday morning treat 🙂 Delicious! No, I do think that people who wouldn’t want to eat brownies for breakfast DO need to reconsider their life choices. 😉 In all, this brownie bake looks amazing! I can’t get enough of the chocolate gooeyness! I had 2nd thoughts when I made this for the first time, 15min was too long to wait hungry but I mustered up the patience and it paid off. This brownie bake was absolutely delicious. I’m not big on sweet so I only used 2 tsp of syrup and no choc chips, opting to sprinkle chopped nuts and flaked coconut on top instead. The bake reminds me of cake. Thanks, I love it. 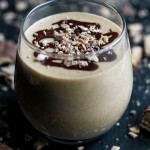 Could this be made with vegan chocolate protein powder ? And if so how would you incorporate it in with the ingredients ? Hi Elaine! I’ve never tried it personally, but I think it should be fine with the protein powder! I would probably just use it in place of the flour. I made this today as a mid morning snack. 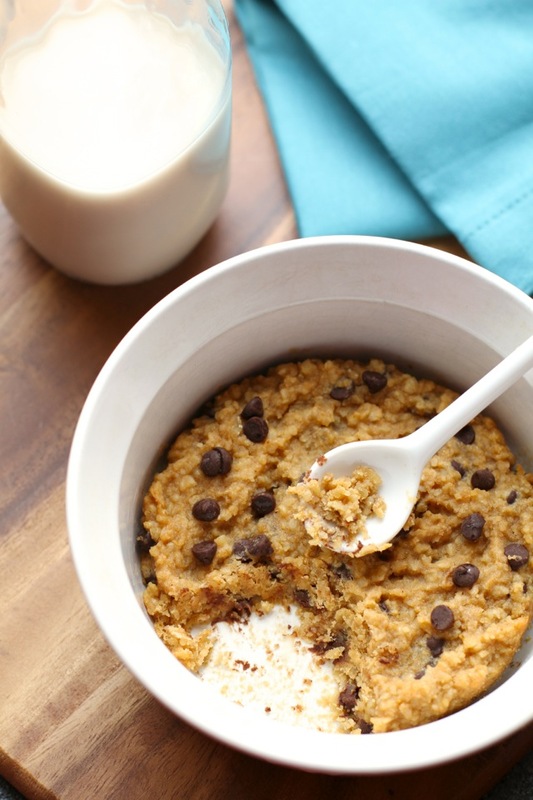 I used whole milk and 2tsp organic sugar cause thats what i had on hand….it was so good! 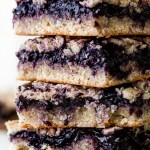 The texture was wonderful and the taste was a perfect sweet tooth fix! This was so delicious! I made mine in an oven-safe mug, so the cooking time didn’t quite work perfectly with mine. That was fine by me, though – I kept it in the oven for around 20 minutes, and the center turned out pretty gooey while the outside was a bit harder. I probably should have left it in longer, but I was impatient and removed it anyway. It tasted amazingly chocolate-y! I added a bit of Fat Free ReddiWip to make it a little sweeter, but it was pretty fantastic without the extra sweetness. The texture of the outside edge was amazing! And this was so easy to whip up. Thanks for an easy, tasty recipe! You are most definitely welcome! I also tried adding in a little twist – I put in a mixture of 2 tbsp softened cream cheese + 2 tsp powdered sugar on the top to make a cream cheese brownie bake. Took it out of the oven after 24 minutes – absolutely amazing! Looked very pretty, too. We try not to use oil in recipes we make at home. Will these turn out the same if I omit the coconut oil? Or do I need to replace it with something? How much will this make? A bowl? or more….. By the way the cake looks delicious.A perfect morning breakfast for me. Yup! It makes a bowl. Can I make it in a toaster oven that has oven temperature settings? It is 80°, with 80% humidity in the morning. I don’t want to add more heat for one bowl of food. I think that should be fine, Nani. I’ve made various recipes like this in my toaster oven with no problem. This is absolutely amazing!! I was hesitant to try it because I wasn’t sure if it would be sweet enough, but it totally was! I actually thought I was eating brownie batter (with oats obviously) and it was a heavenly breakfast. I used agave instead of maple syrup, but I think those are pretty equal. Highly recommend this recipe to anyone who has been thinking about it. Totally delicious and mostly healthy!! This recipe has become a fabulous jumping off point for me! It has tasted great every time (with additional milk added at the end), except for the time that I didn’t add flour. I love that I can get a dose of chocolate in the morning but in a nutritious way. I’m working my way towards reducing my sugar intake, so this has been a lovely way to help me not feel restricted yet still limit how much sugar I eat. Amanda, thank you so much for this recipe!!! Thank you so much for taking the time to write such a wonderful and helpful review, Candice! It’s especially helpful to know that it can be made in the microwave for those busy mornings. If I cold post a picture of this yumminess I would. I only used 1 tbsp of flour (gluten free) and just a few chocolate chips on top and it’s devine. Thank you thank you for bringing a brownie to my oats!! This looks great, but I think there might be a typo with the ml amount for the almond milk. All of my measuring spoons and cups were dirty from another recipe, so I tried to make this with the measurements in parentheses and my kitchen scale. It seemed like way too much liquid, (probably should have realized and double checked then…buuuut I don’t know much about recipes and measurements so I went with it!). It never cooked and then I looked up 180 ml and it looks like that is actually 3/4 cup! 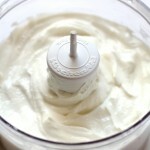 I am going to try again tomorrow morning with real measuring spoons and cups and I am sure it will be delicious! UPDATE: I made with my measuring spoons/cups and it was AMAZING! Chocolate for breakfast is my favorite! Have you heard of the Peanut Principe company? They make a brownie batter peanut butter (http://www.peanutprinciple.com/brownie-points/). I melted it on top of the breakfast break for a perfect topping! I cannot wait to make this Saturday morning!! I do have one quick question- do you think liquid stevia could be substituted for the maple syrup? That is what I have on hand. I’ve never tried subbing between the two before, so I’m not sure how or if it would work. It would work, Emily, just make sure not to use as much. Liquid stevia is a lot more potent than maple syrup, so you’d probably only need a few drops. Mine came out very runny and I followed the recipe. I had to cook it way longer. 1/3 cup oats and 1/3 cup almond milk, right? Hello! I found your site through Pinterest (<3) and I had a couple questions: 1. Can I use honey in place of the maple syrup and 2. can I make this in a larger batch and make it ahead of time, say on a Sunday to eat all week? I used honey in place of the maple syrup and it turned out lovely. I’ve tried two of your oatmeal bakes (pumpkin pie and this one) for my family of ten. I used a recipe converter online and it was easy because one serving x ten works out pretty well. I baked it in a 9×13 pan and baked for 28 minutes (it needs a little longer for the pumpkin pie version) and it came out beautifully and was a big hit. In fact, the first time I tried it I was cooking for my family of ten and my sisters family of 8, so I converted for ten portions and then doubled it. All the kiddos loved it. Thanks for a great recipe!!! I have one child who loved this, another who didn’t, and a third who will eat anything. 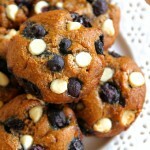 I think my middle child would like the blueberry muffins bake, but I know her sister wouldn’t. Unfortunately, they cook at different temps for different amounts of time. How forgiving are these recipes? Could I add extra liquid to this and cook it at a higher temp? I’d love to make each child her favorite – and have them share with their brother! They’re pretty forgiving, Daphne. I think you’d be totally fine with adjusting the amounts of liquid to coordinate cook times. There is! It’s sweetened with maple syrup. You can also use honey or sugar if that’s more convenient. Of course it would be… forgot it was single serve!! My wife asks me to make these all the time. I added a few walnuts and raspberries, that really puts it over the top. Thank you so much for this recipe. My family just finished eating it and it was delish! Will make it again also as a dessert. I just had this and it is amazing! 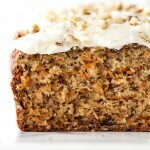 I added almond flour instead of flour and added pecans to it….sooo delicious! Thank you for sharing. Could you make this recipe ahead of time and store in the fridge until you are ready to bake it?